The Bachelor started back up a few weeks ago. Now, I didn’t start watching until two seasons ago, mainly because Ben Higgins was so darn cute, but every time a new season starts, I have mixed feelings about it. On the one hand, it’s certainly entertaining… in much the same way that watching a train wreck is entertaining. You know you should look away, but you just can’t. The Bachelor is the rubbernecking god of ABC. On the other hand, the show is, in my opinion, wholly demeaning to women. When there is a female Bachelorette, like JoJo last season, the focus on the men is their job. How many times, for example, did we see that Evan was an “erectile dysfunction specialist.” Trust me—it was a lot. (I guess that bodes well for Carly, though, who he proposed to on Bachelor in Paradise.) On that season, we learned that Alex was a U.S. Marine, Grant (formerly of Grace) was a firefighter, Wells was a radio DJ (Hey Wells, if you’re single, call me! ), and James Taylor was, unironically, a singer-songwriter. We never, throughout the entire season, found out what, if anything, JoJo did for a living. When there is, instead, a male Bachelor, it seems that the focus is less on what a woman has to offer the world in terms of her career and more on her looks/hair/figure, and perhaps more still, her age. Nick Viall, the new (old?) Bachelor is 36 years old. I like that. He’s old enough to presumably make mature decisions and has enough life experience to know what’s right for him and what’s not. Do you know what the ages of the suitor(esse)s that were presented to him are? They range from 23 to 31. That’s right—the oldest woman is still five years younger than our main man. Four of the ladies are 23, a whopping 13 years younger! Nick was entering college when they were entering kindergarten! In fact, all but three women are under 30. I often date men younger than I am, and even if it’s just by a year, people love to comment about it. “Ooh—robbing the cradle, I see.” “A younger man—good for you!” “Who knew he liked older women?” It’s also a conversation I have with my clients all the time, especially those over 50. I have found that 95 percent of my clients over age 50 tell me that the other gender doesn’t age as well as theirs. Even a recent 38-year-old male client refuses to date women over 31. But, you know, everyone ages, everyone gets wrinkles, everyone has baggage. Age doesn’t define us. You have to look at people as individuals. 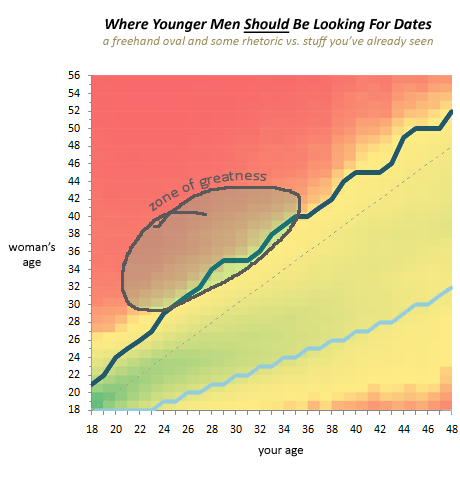 I loved the conclusion of the study, which encouraged men to date women their own age or older, putting them into the “zone of greatness.” Yes, please. I’m not naïve to the fact that we can all be superficial and notice someone’s looks first, and men especially want a younger woman because she’ll supposedly preserve her beauty longer than someone who is older. (I know I’ve skipped the whole childbearing rationale… I could have written a novel if I included that.) But, I have to wonder, at a certain point, if you’re almost a generation apart, what do you have in common? I guess only time will tell this season. But Bachelor Nation, I hope this gives you some food for thought. I was so fired up that I even discussed the dating double standards with my friends at Let’s Talk Live on ABC7. ← You’re Such a Liar!